As reported by TMZ magazine, both Mariah Carey and Bryan Tanaka had mutually parted ways after five months romance, immediately after Mariah Carey break it off with her former fiance, James Packer. A reliable source reported that Bryan Tanaka had struggled with Mariah Carey’s deep & close relationship with her ex-husband, Nick Cannon, who she sometime holidays with. 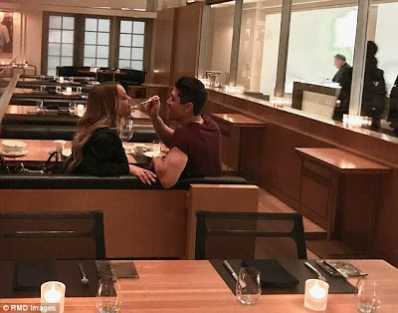 After a month of separation between Mariah Carey and her fiance, Bryan Tanaka, the joyous new of their reconciliation and getting back into the love relationship hits the air on Friday when Mariah Carey was spotted with Bryan Tanaka on an intimate date. Nobody could doubt it as the duo was seen kissing. The relationship between Mariah Carey and Bryan Tanaka is surely back and, Mariah Carey confirmed it by sharing a FBF of both of them on her page.